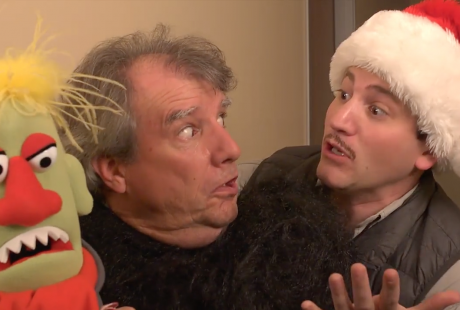 Chip & Bernie are back in a new short film for the website iSpotSanta and this year they are joined by new characters that children love. We have the loyal and informative 2-PAY-PI, a robot that Chip built. The Christmas enthusiast Mary Blue, a puppet who lives a life of mistaken identity. Lastly, we meet the mastermind of EVIL Inc. a corrupt and vicious puppet by the name of Dr. Inconceivable. After Santa Claus entrusts Kent Cook to look after the Christmas Bell, the bell that navigates his reindeer on Christmas Eve, Kent is kidnapped! Santa’s number one Elf, Dorf played by 6 time Emmy winner Tim Conway asks the comedy team Chip & Bernie to find Kent and save Christmas. Bernie is played by Marc Robert and Pasquale Murena (me 🙂 ) plays Chip, will Chip and Bernie be able to find Kent Cook, return the Christmas Bell to Santa before Christmas Eve and save Christmas? Find out in our new short film with your favorite holiday comedy team.